A new image from a telescopic camera orbiting Mars shows NASA’s Mars Exploration Rover Opportunity at work on “Murray Ridge,” without any new impact craters nearby. The Feb. 14 view from the High Resolution Imaging Science Experiment (HiRISE) camera on NASA’s Mars Reconnaissance Orbiter is available online at http://www.jpl.nasa.gov/spaceimages/details.php?id=PIA17941. Rover tracks from Opportunity, as well as the rover itself, are visible. A rock, dubbed “Pinnacle Island,” appeared in January 2014 next to Opportunity where it had been absent a few days earlier. After that, researchers using HiRISE planned this observation to check the remote possibility that a fresh impact by an object from space might have excavated a crater near Opportunity and thrown this rock to its new location. No fresh impact site is seen in the image. Meanwhile, observations by the rover solved the Pinnacle Island mystery by finding where the rock had been struck, broken and moved by a rover wheel. Murray Ridge is part of the western rim of Endeavour Crater, an impact scar that is billions of years old and about 14 miles (22 kilometers) in diameter. The High Resolution Imaging Science Experiment (HiRISE) camera on NASA’s Mars Reconnaissance Orbiter caught this view of NASA’s Mars Exploration Rover Opportunity on Feb. 14, 2014. The red arrow points to Opportunity at the center of the image. 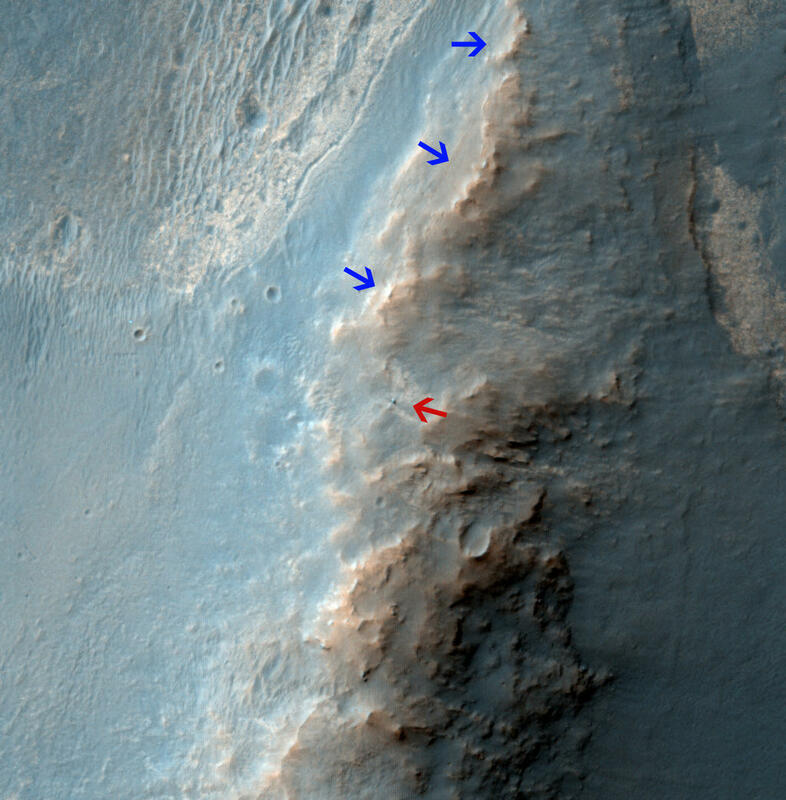 Blue arrows point to tracks left by the rover since it entered the area seen here, in October 2013. The scene covers a patch of ground about one-quarter mile (about 400 meters) wide. North is toward the top. The location is the “Murray Ridge” section of the western rim of Endeavour Crater. Image Credit: NASA/JPL-Caltech/Univ. of Arizona. This entry was posted in Mission News and tagged Mars, Mars Exploration Rover, Mars Reconnaissance Orbiter, mission, NASA, Opportunity, orbiter, rover, spacecraft on 2014-02-24 by Heather Dalton.